You guys, I have to admit something. I think I have a problem and I think I might need to be in BA -- bake-aholics anonymous. Insert a pie emoji, cookie emoji, cake emoji, bread emoji, and then the monkey covering his eyes emoji. But in all seriousness though, I love baking. LOVE. As I've mentioned before, I don't cook. I can't cook. I over cook everything I try to cook because I am afraid of it being under cooked and therefore it tastes terribly dry and awful. This I know about myself. But baking... baking is my jam. I'd bake something everyday if I wasn't worried about gaining 300 pounds. So, I limit myself to once every other week or so, depending upon what items I have on hand. And I love summertime. The summer is when all the gorgeous fruits are in season and they are the freshest and the tastiest -- strawberries, cherries, peaches, plums, watermelon -- I love summer fruits! They make a great snack and are so refreshing on these hot summer days. I especially love going to our local farmer's market and seeing what they have. Unfortunately for me though, I don't always have time to get to the farmer's market every week, which is where this awesome service called Farm Fresh To You comes in. They do the leg work for you (collecting of all those delicious fruits and vegetables) and deliver it to your doorstep. Yep, you heard me right. From the farm to your doorstep! Heaven for a busy, working mom like myself! And one of the other awesome parts? They have tons of different options like fruit only boxes, veggie only boxes, no cook mixed boxes, small boxes, large boxes, and they are all totally customizable! There is surely an option to fit every family size and every lifestyle. I recently had the opportunity to try out this service and let me tell you, when I saw that box of goodies on my doorstep in the morning, I couldn't have been more excited to dig in and see what was inside. The delivery happened to be on the Tuesday after Mason's birthday weekend, which was PERFECT timing for me since I didn't have time to go to the grocery store that weekend (since we were having too much fun!). The big box of fruits and vegetables helped me easily complete my meals with proteins that we already had on hand -- BBQ chicken with grilled corn and watermelon, "naked" burgers wrapped in butter lettuce with heirloom tomatoes, mini bell peppers, artichokes and french fries and more. The box even came with a paper with recommended recipes, one of which was a pluot/wine cocktail recipe, which of course I had to try (and loved!). We were able to get so much use out of our box and the best part was that Mason loved everything too! We used most of the fruits and vegetables to add to our pre-determined meals for the week as I like to have a vegetable at least with every dinner. And, as I mentioned above, I love to bake so I was pretty stoked when I saw all these gorgeous, fresh, organic peaches in my box. I'd been wanting to try my hand at making a pie on my own (semi from scratch) and I knew the peaches would be the perfect star for the pie. 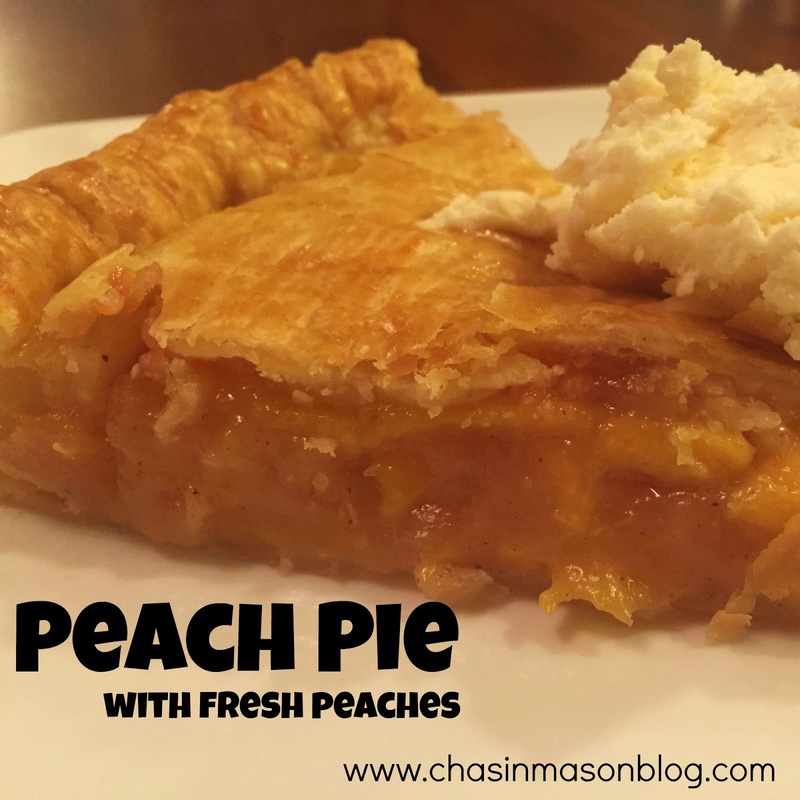 I looked up some recipe options and finally settled on one from All Recipes : Peach Pie the Old Fashioned Two Crust Way and it did not disappoint! 2. Line the bottom and sides of a 9 inch pie plate with one of the pie crusts. Brush with some of the beaten egg to keep the dough from becoming soggy later. 3. Place the sliced peaches in a large bowl, and sprinkle with lemon juice. Mix gently. In a separate bowl, mix together the flour, sugar, cinnamon, nutmeg, and salt. Pour over the peaches and mix gently. Pour into pie crust and dot with butter. Cover with the other pie crust and fold the edges under. Flute the edges to seal or press the edges with the tines of a fork dipped in egg. Brush the remaining egg over the top crust. Cut several slits in the top crust to vent steam. 4. Bake for 10 minutes in the preheated oven, the reduce the heat to 350 degrees F and bake for an additional 30-35 minutes, until the crust is brown and the juice begins to bubble through the vents. If the edges brown too fast, cover them with strips of aluminum foil about halfway through baking. Cool before serving. This tastes better warm than hot. In my opinion, it's best served slightly warm with ice cream on the side and is perfect if you're in charge of dessert for a summer BBQ get together! The freshness of the peaches, the buttery-ness of the crust, and the cool, refreshing ice cream make it super summery and wonderful. In fact, I would recommend making it when you're going to a gathering because we made the mistake of making it on a weekend when we didn't have any plans, and we might have finished the whole pie in four nights flat. Oops! Overall, our Farm Fresh to You box was a huge hit with the whole family and a service I'd love to take advantage of more in the future. I absolutely love the customization and the convenience of the service, it is perfect for us busy moms! If this sounds like something that you can benefit from too, then you save $15 off their first box with the promo code WEAVE15. Click here to see if they deliver to your area! Yum! Now I want pie for breakfast! What an awesome service! I'm not a big pie person, but that looks really good! Especially that last photo - yum! Our neighbors have their produce delivered like this! I always see that box on their stoop and wondered what exactly was all in it. Let's stop for a moment and drool over that pie. Seriously. Drool. Deeeeelicious!!!! It seems most are either a baker or a cook. I definitely am not a baker. I just don't have the patience to measure, not taste/season as I go, or remember to set the timer. ;-) I do love peach pie with a vengeance though. I cannot bake at all - not.at.all. I wish I could, believe me it is not from lack of trying. I am just not very good at it. Sad I know, I can bake from a box but from scratch - forget it. It sure looks good, but man I do not enjoy peaches. How about apple pie =) I think that may be the only fruit pie I've had...not sure. Chris loves peaches. He has asked me to make peaches and cream pie for years, but I have no idea what it even is AND I'm sure if I did make it it would not be what he was remembering from his childhood. I think those type of requests are set you up for failure types. I did that with apple crisp. It did not end well. I've been wanting to try Farm Fresh To You (which Brian just rolls his eyes at me because, well, duh, he can just pick up the same things locally at work. But stilllll) lol nothings better than happy mail, am I right?! Your pie looks amazing! What a fantastic box of goodies. That pie, oh my goodness I want some pie SO bad right now. I'm a baker too, mama! Having to lay off the baking a bit - because honestly, what's a good pie without butter, lol - has been hard. Worth it for my sweet Vivi. But I do have to say that I am very much looking forward to being able to getting back to it one day:) Bookmarking this for that day! Everything looks so fresh and delicious. And I have been craving peaches something fierce lately.